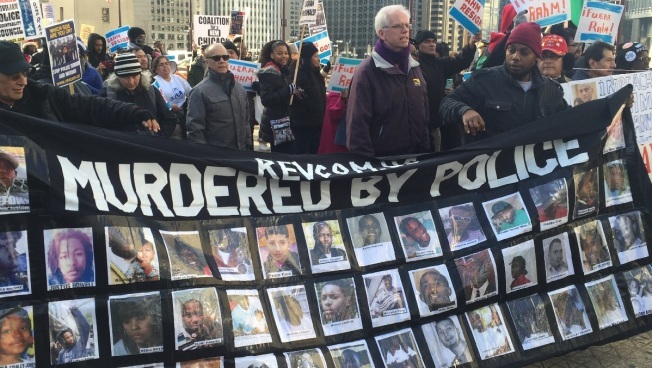 Demonstrators marched downtown on the Magnificent Mile over the fatal police shooting of Laquan McDonald. Dozens were seen chanting "16 shots and a cover up," and "Rahm gotta go in 2016." They also staged die-ins while on the street. A group that calls itself The Coalition for a New Chicago said the march would start at noon on the south end of the shopping district and move north. The release of the dashcam video of the 2014 shooting of the black teenager has sparked protests across the city, including a citywide walkout on Dec. 9 with many calling for Mayor Rahm Emanuel’s resignation. Meanwhile, Radio calls obtained by NBC5 through a Freedom of Information Act request Wednesday reveal that a dispatcher requested a Taser to subdue McDonald the night he was shot 16 times by Officer Jason Van Dyke.